Thanks to a stable and open economy, a very low national debt, a clear rule of law, and numerous emerging industries, property in Chile represents a rare investment opportunity today, with limited downside risk and significant upside potential. 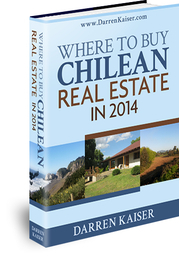 Your purchase of the Where to Buy Chilean Real Estate in 2014 is satifaction guaranteed. If you decide within 60 days of your purchase that you are unsatisfied with Where to Buy Chilean Real Estate in 2014 in any way, a full refund will be made upon request. Navigating the Chilean market can be difficult, though, if you don't have years to spend monitoring trends and scouting properties throughout the country. 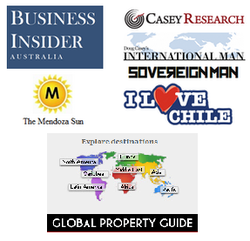 Where to Buy Chilean Real Estate in 2014 identifies 5 new locations that represent some of the most powerful investment destinations, not just in Chile, but any where in the world right now. The guide also includes updates on recommendations from past property guides, some which have appreciated by 50% per year ever since, plus some very practical information about investing in property in Chile. Chile is one rare example in today's world where the standard of living, along with property prices, will most likely be increasing for many, many years to come (a large part of why I call this part of the world home). From the best places to buy farmland to how to profit from coastal development to where to buy a mountain sanctuary, there are some very attractive destinations to consider. "On the northern edge of -------------, work is just about to get started on a $50 million USD renovation project of the 100 year old ----------- building, also known as ---------------------. The multifaceted development is set to include its own plaza, a 35 room boutique hotel, an open air market, 4,000 square meters of office space....."
"There really aren’t any subdivisions in this area today. It’s still almost all agricultural land, however, that might be changing soon. The government is talking about paving the rest of the road, the --------, that loops back around to --------------------------and if this happens, there’s a very good chance more houses will start springing up in the area and prices should rise accordingly." "The neighborhoods that are higher up on the hills here have views of the river and the ocean, some of which have to be among the most spectacular areas I’ve ever come across. Being in some of the little pockets of nicer homes tucked throughout the city, you’d think you were in an exclusive area on the Californian coastline." From the little known tourist towns to quiet mountain valleys, or from the a building in an increasingly international neighborhood of Santiago to land in the path of development, these are areas in Chile that you're going to want to know about before they become much more popular investment destinations. Chile ranks very high in regards to personal freedom, private property rights, and economic stablity but almost more important than the purely financial reasons for investing here is the peace of mind that comes with owning quality land in a country with a surplus of food and agricultural production, vast mineral reserves, a strong currency, and an extremely positive future trajectory. For those of you who don't know me, my name's Darren Kaiser. Over the last 10 years I've spent a lot of time traveling the world; 42 out of 50 US states, most of Europe, almost the entire Pacific coast of the Americas, and a four month stint in Africa crossing the Saharan desert. In mid 2010, I came to Chile in order to do two things. 2. Buy a rural, agricultural property that could work as a "back up plan" residence. Within just a couple of months on the ground here, I decided to set a new goal for myself; learning as much about, and gaining as much exposure to, the Chilean property market as possible. About half of the property scouting I do here is in areas where there aren't any real estate agents so just getting an idea of average market prices and finding comparable properties is a time consuming process. Finding a competent and reliable lawyer that didn't charge an arm and a leg took several tries, and locating and learning the hours of the local recording offices and canal association headquarters in numerous cities and towns up and down the central regions took a lot of patience. Upcoming construction/infrastructure projects are also something I have to stay on top of. Monitoring local newspapers, magazines and websites on a regular basis, scanning for new announcements, and staying in close contact with those involved in politics and business down here takes up several hours every week. Last but not least, in order to actually evalute different parcels and identify where the best properties are located, you need to know average well depths (and hopefully canal flow rates) for multiple zones and have a solid understanding of soil classifications used in Chile. It hasn't been easy, but really great things never are. The Where to Buy Chilean Real Estate in 2014 is the culmination of my work down here so far, the "results" from three years of doing business and on the ground (and in the field) investigations. I am quite confident that it will be useful to anyone considering buying or investing in property in Chile in the coming years. in any way, a full refund will be made upon request.